[Scott] Waking up early for a change today, at 6:30am, I went out for a walk before the heat moved in. 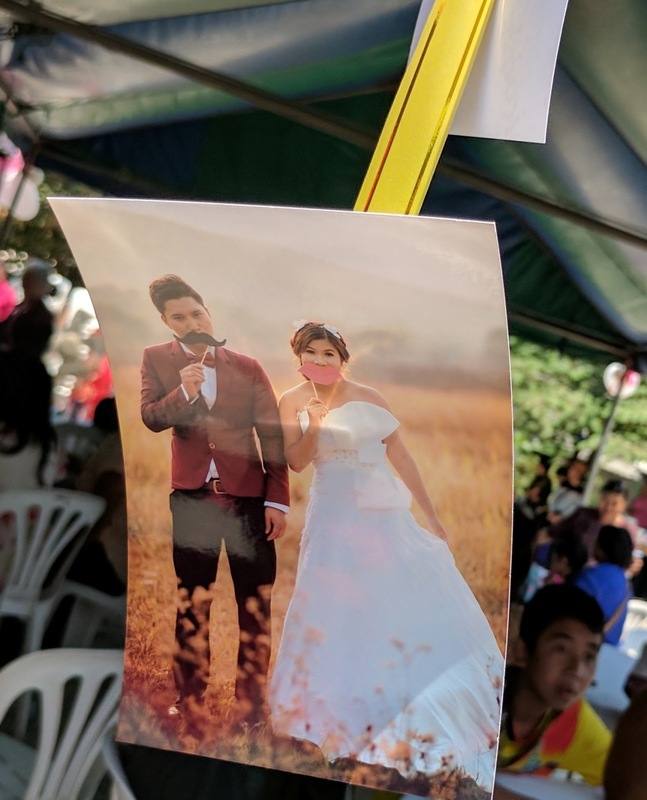 While rounding the corner near our condo building, I noticed that they were setting up for a wedding, with tents, tables, pink and white balloons, and a "curtain" of photos of a happy couple in combinations of western and hill tribe wedding costume. I snapped a photo of the setup, then headed back to the condo to start our day. After spending a lovely morning at a beautiful pottery school/sculpture garden/café for our morning cappuccino (S) and hot Thai tea latte (C), we took a stroll around the old city before heading back to the condo. By the time we were back at around 11:30am, the wedding affair seemed to be in full swing, so I suggested heading down to see if we could catch a glimpse of the scene. After just a few moments of standing across the street as onlookers, one of the participants came by and started waving us over...and rather insistently so. 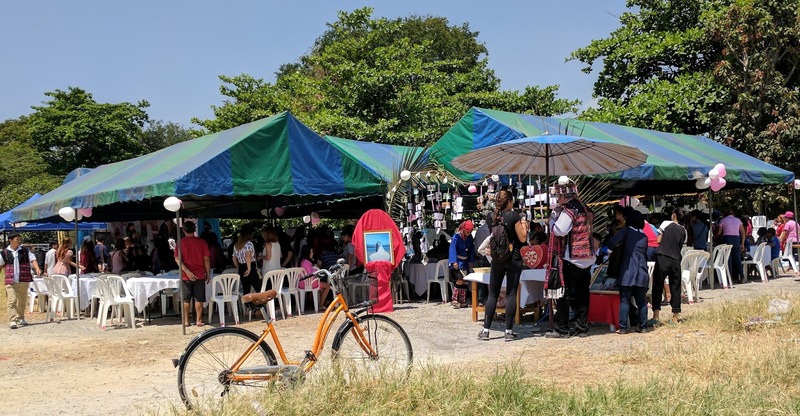 So we made our way to the "check-in", where there was a small congregation around the card collection box, and were immediately handed ice cold water by a friendly, older western guy with watery, blue eyes (he seemed French). 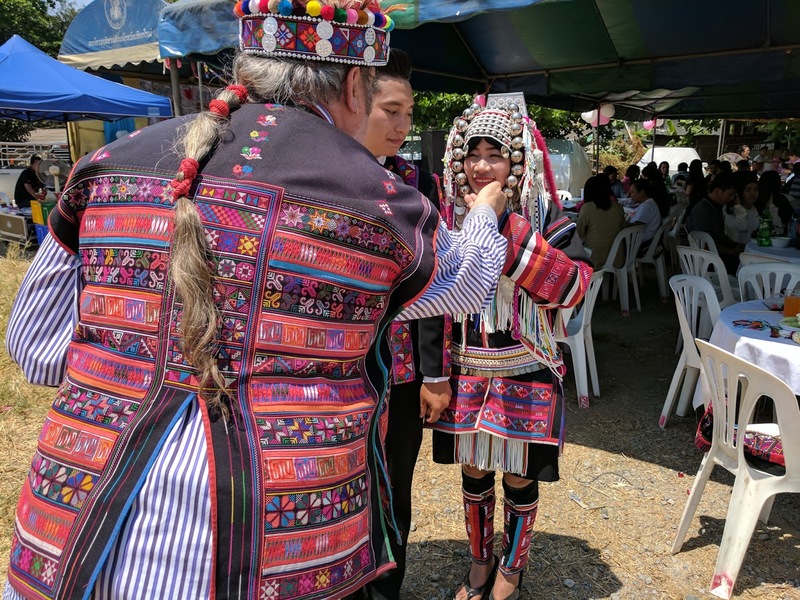 He was dressed in partial hill tribe garb and sported a long, gray, pony tail that was festively tied into sections with red string/ribbon . 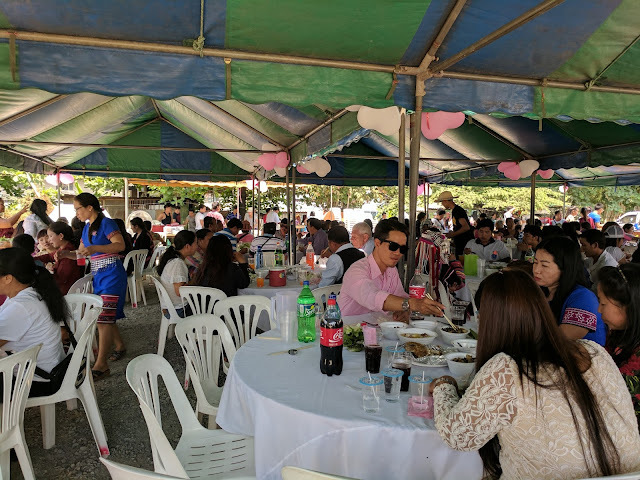 By way of greeting, he jovially insisted that we go take a seat at one of the tables under the tents for some shade, pointing out that the meal was about to be served. Invited in, as things are in full swing. That's our host on the right, beneath the umbrella, in the colorful vest. So, we made our way, vaguely uncomfortably, to a table near the edge of the festivities. 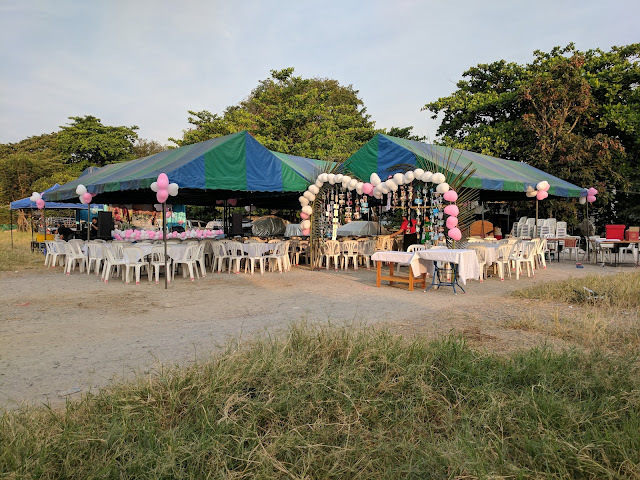 While the bride and groom were finishing up their photo session on a stage at the front of the party, the staff (that is, some of the guests), started bringing around large trays of a variety of foods to place on each table. Steamed whole fish, vegetables with pork, pork soup, pork offal, and chunks of various pork cuts, along with chile "salsas" and individual bags of sticky rice. Quite the feast. 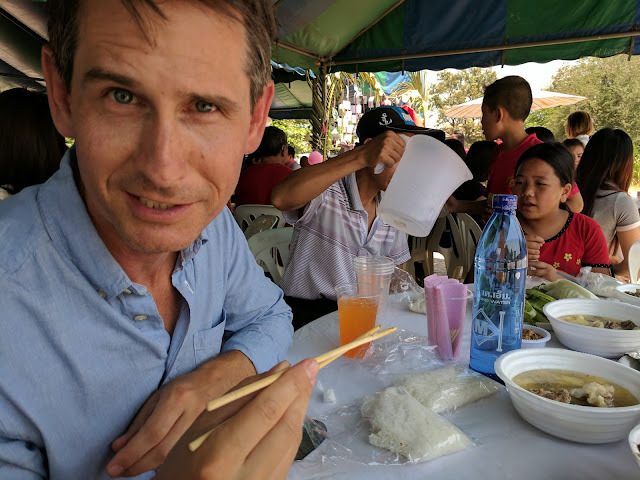 Before we started digging in, carefully observing the local man and two little girls also seated at our table for etiquette tips, the older western gent sat down next to us seemingly to see how we were doing. Turns out, Georges (he was indeed French) was the father of the groom! After hearing that, we felt much less like crashers and more like welcome guests. We proceeded to have lunch with the rest of the wedding guests, and Georges popped by a couple more times to chat with us about where we were from, while we got to ask him a few questions about the wedding and his life. Scott, appearing to attempt to be a travel show host explaining the local traditions - as if he has a clue! 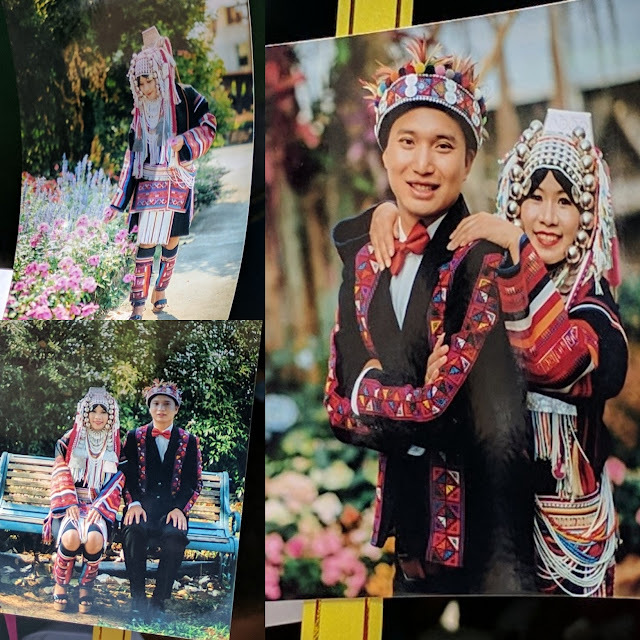 The first thing we learned was that this was an Akha wedding. The Akha tribe comes from Tibet and Mongolia, and have spread a bit across Myanmar, Laos, and Thailand as they've been pushed out of other areas. Apparently they're not so welcome in the areas of Southeast Asia they've been pushed to, either, including Thailand. 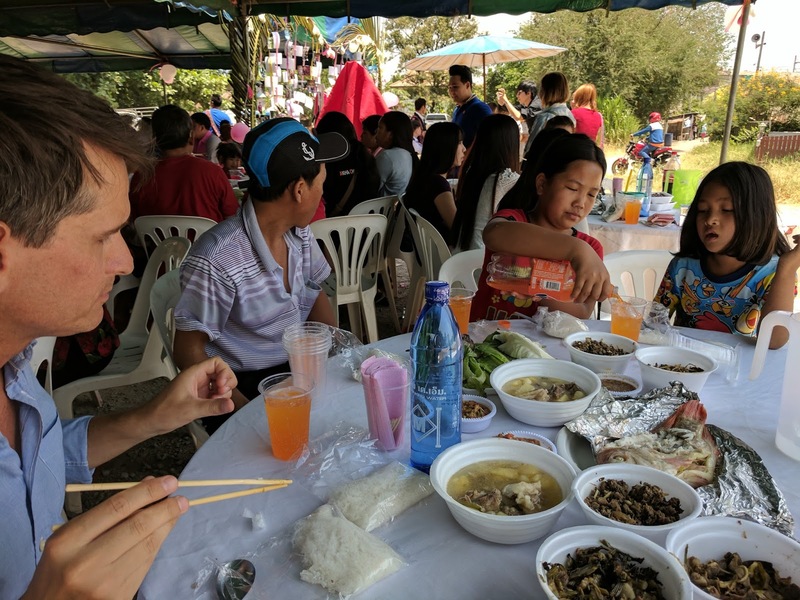 According to Georges, many of the guests only speak Akha, not Thai. Georges himself is fluent in Akha, but only knows a bit of Thai, even though he lives for six months a year in a house across the tiny river (formerly - and possible still - the town sewer, according to Georges) from where the wedding party was taking place. 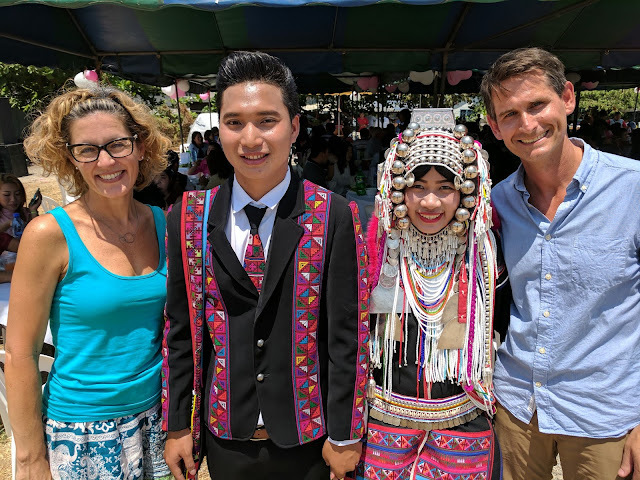 He's been spending half his time each year in Chiang Mai for the past ten years, with the other six months in France where he can earn some money. He and his wife have five adopted Akha children, and he has another child back in France. The groom, he explained when Caroline asked, was maybe 25 or 26 years old. 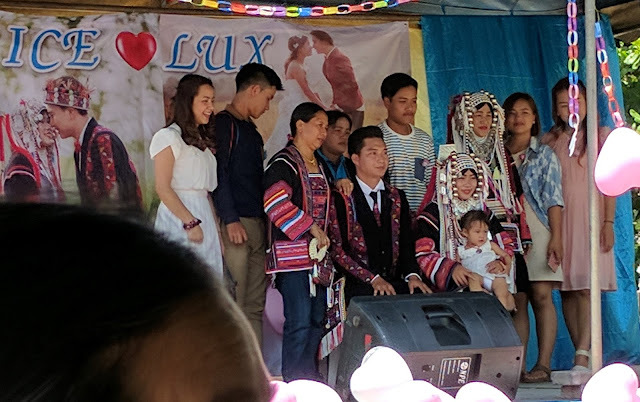 He says it's a little confusing, since there was no birth registration, and also Akha children are born one year old, and turn two as soon as the Akha New Year happens (so could be "two years old" the day after their birth). The first part of the wedding had already taken place, up in the mountains at the bride's mother's family home. Georges did not go, as it sounds like custom dictates that they display some kind of displeasure that the bride's family is taking their son away. Last night in Chiang Mai, a small pig was killed for the previous night's feast. This morning, at 5 am, they killed another 200 lb pig, (oh, no wonder so much pork) for today's celebration. After dessert was passed (sliced watermelon, some kind of dried legume, and sunflower seeds), Georges helped us summon over the happy couple so that we could get a photograph. 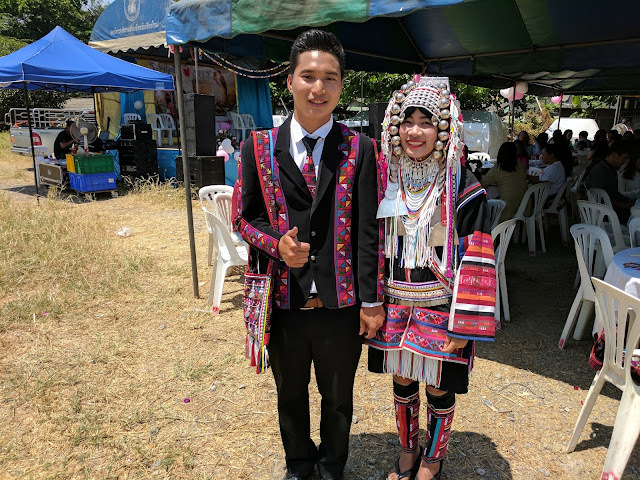 He volunteered to take a photo of the four of us, so we figured, what the heck, when is the next time we're going to be invited to an Akha wedding? They looked great. We looked.... like sweaty, uninvited guests who were not appropriately dressed for a wedding. But they politely humored us. Looking beautiful. 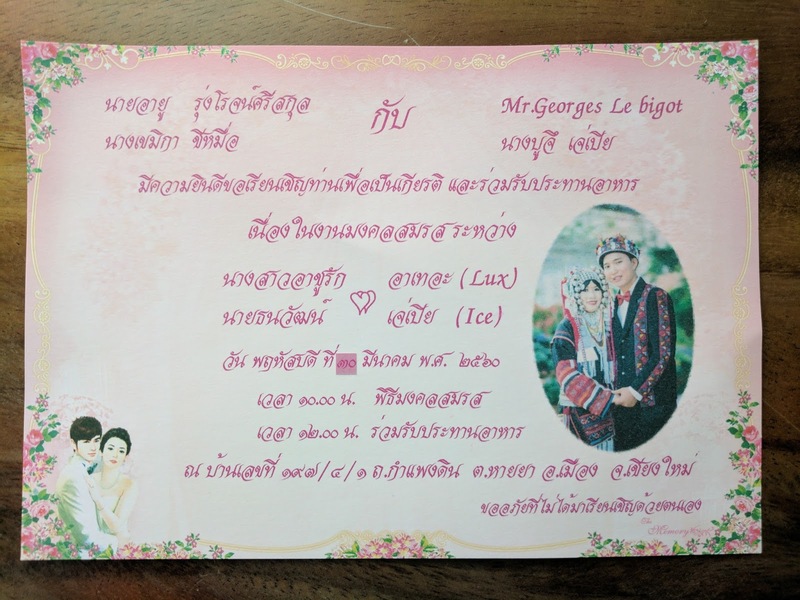 Thanks Ice and Lux, for letting us farangs in on your big day! Georges gave us some envelopes, with wedding invites inside, explaining that the custom was to keep the invite, then write a note on the envelope and drop it in the heart-shaped collection box by where we entered. It goes without saying that custom also involves adding some funds to the envelope before dropping it in the box. 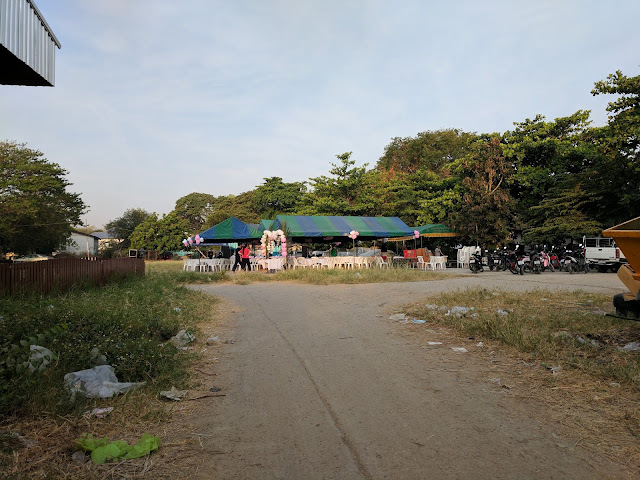 We added our notes, a few baht, and headed back to the condo less than 100 yards away, taking our wedding favors and a most interesting memory from Thailand. Thanks for allowing us to take part in your big day, Ice and Lux - best wishes for a long and happy marriage! Collage of earlier photo shoots about town, from pictures hanging from "photo curtain"
Our invite/keepsake. We couldn't have said it better ourselves! Congratulations and best wishes, Lux & Ice!